Knowing is a hugely impressive, enjoyable and thought-provoking sci-fi drama directed by Alex Proyas and starring Nicolas Cage as MIT professor John Koestler. Recently widowed and with a young son named Caleb (Chandler Canterbury), John spends much of his spare time staring into the bottom of a whisky glass, until a time capsule, buried 50 years ago by the class of 1959, is opened at Caleb’s school, and Caleb inadvertently becomes the recipient of a sheet full of seemingly meaningless numbers, scribbled onto the sheet by a strange little girl named Abby half a century ago. After finding the paper in Caleb’s bag, John discovers to his horror that the paper has accurately predicted the date, place and number of deaths of every major human disaster in recent history – and also seemingly shows where the next ones will take place. To reveal what takes place next would do the film a disservice – suffice to say that as the story develops it raises a number of interesting theological and sociological questions while presenting several visually spectacular, emotionally visceral action sequences that are as technically impressive as they are awe-inspiring. Alex Proyas has always had a knack for bringing out the best in his composers. Graeme Revell wrote one of the best scores of his career for Proyas’ first major film, The Crow, in 1994, and Trevor Jones delivered the goods on Dark City in 1998. Proyas seems to have settled on Marco Beltrami as his current composer of choice, following their successful collaboration on I Robot in 2004, and Knowing may well be the best of the bunch: a huge, startlingly good orchestral tour-de-force which lets Beltrami push the envelope, writing music which is at times menacing, at times exciting and energetic, and at times stunningly beautiful. Don’t be put off by the somewhat sinister opening. After the conclusion of the dark, slightly menacing, but generally impressive “Main Titles”, much of the early part of the album is given over to suspenseful mood music, the Sydney orchestra churning portentously, with brooding chords and clamoring percussive dissonance the order of the day. There has always been a touch of both Jerry Goldsmith and Bernard Herrmann in Beltrami’s suspense writing, and so it is the case again here. “Door Jam”, for example, is a frenzy of plucked basses, pizzicato violins and unrelenting motion, reminiscent of Herrmann at his most unsettling, cleverly depicting the confusing chaos afflicting poor little Abby’s waking nightmares. Later, “Numerology” features more pizzicato writing alongside a harp element which is unexpectedly creepy, while “Trailer Music” (which is not the music from the film’s trailer) and “33” are appropriately eerie, all ominous string chords and clanging metallic percussion, gradually rising to a series of crescendos which provide several spine-chilling moments of shocking musical discovery. The first real action material appears in the impressive “New York”, a tense, percussive piece which begins with hooting woodwinds offset by nervous tapped strings, bold brass blasts and a relentless synth pulse, before emerging into an almost Goldenthal-esque piece which skitters around the orchestra with great dexterity and is as turbulent as it is clever. Later, the truly fearsome “Moose on the Loose” allows Beltrami to engage in some enormous, supremely discordant orchestral writing, which is difficult to listen to but greatly striking on a purely technical level. Later, “Loudmouth” allows Beltrami to have some fun putting the orchestra through its paces, with boo-gotcha stingers, enormous drum hits and all manner of choral anarchy, while “Thataway!” revisits the energetic style of the New York sequence with power, dexterity and flair. A gentle father-and-son piano/string combo theme appears in “John and Caleb”, tempering the onslaught elsewhere; its larger variations in “Aftermath” and the tender “John Spills” are slightly reminiscent of the lush Professor Bruttenholm theme from Hellboy, while the cello solo in “Revelations” is a further highlight. It’s also worth mentioning the electronic sound design by Beltrami’s long-time collaborator Buck Sanders, which is integrated seamlessly into the orchestral performance, and adds a genuinely interesting musical layer to the score. The coup de grâce, however, is the utterly magnificent 11-minute sequence which begins in “Shock and Aww” and reaches its zenith in “Caleb Leaves”. Beltrami’s music in these two cues is as majestic as it has ever been, rising to truly awe-inspiring orchestral and choral heights. It’s probably the closest Beltrami has ever come to writing something on the same scale as the finale from E.T, or Close Encounters of the Third Kind, if that gives you any kind of indication as to the enormous musical forces in play. “Caleb Leaves” especially contains some memorable elements, including the moody viola solo during the cue’s first two minutes, the tender piano performance, and the goose-bump inducing finale, during which Beltrami wrings every ounce of majesty from his orchestra. The final trio of cues – “Roll Over Beethoven”, “New World Round”, and slightly flippantly-named but no less impressive “Who Wants an Apple?” – continue on a similarly large-scale vein, with a strong brass performance of John and Caleb’s theme towards the end of the former, and an elaborate, quasi-religious flourish to the score’s overall conclusion, complete with an appropriately angelic choir and tolling bells. 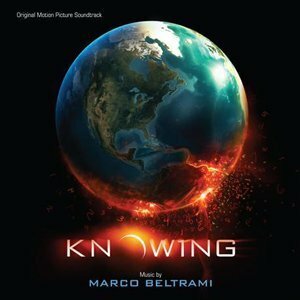 It’s been quite a while since a Marco Beltrami score impressed me as much as Knowing has; this is probably his most impressive effort since the tail end of 2004 when he wrote Flight of the Phoenix, I Robot and Hellboy in the same year. Anyone whose exposure to Beltrami’s work has been through his more recent horror and thriller scores would do well to seek out this score, because although its tone is not greatly different from some of his more recent efforts, and although there is still a great deal of difficult dissonance and nervousness in the suspense writing, the high points are more than worth the wait. Music composed by Marco Beltrami. Conducted by Brett Kelly and Brett Weymark. Performed by The Sydney Scoring Orchestra and The Song Company. Orchestrations by Rossano Galante, Dana Niu, Bill Boston and Marcus Trumpp. Additional music by Marcus Trumpp. Recorded and mixed by John Kurlander. Edited by Tim Ryan and Simon Leadley. Album produced by Marco Beltrami and Buck Sanders.